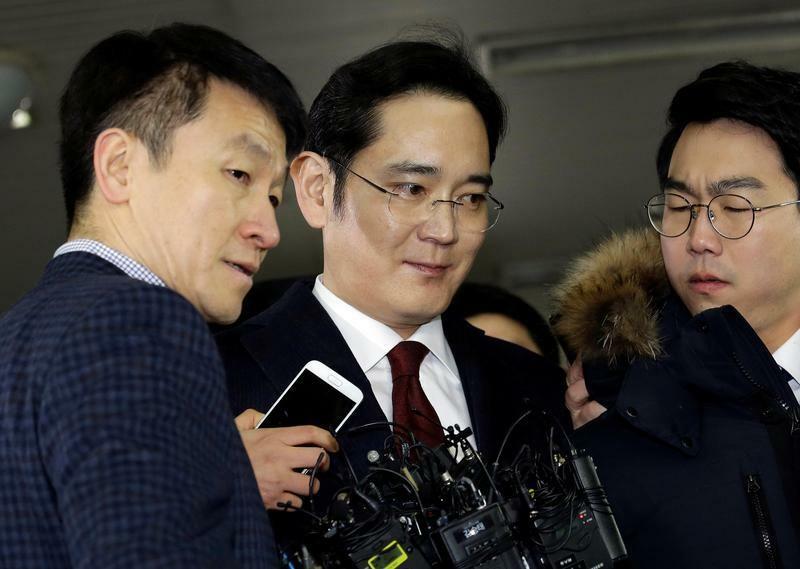 SEOUL (Reuters) - Samsung Group leader Jay Y. Lee left the South Korean special prosecutor's office early on Friday after more than 22 hours of questioning on bribery suspicions in an influence-peddling scandal that could topple President Park Geun-hye. Lee left the special prosecution office without answering reporters' questions and headed to a waiting car. Prosecutors have been investigating whether Samsung provided 30 billion won ($25.46 million) to a business and foundations backed by Park's friend, Choi Soon-sil, in exchange for the national pension fund's support for a 2015 merger of two Samsung affiliates. The special prosecutor's office said it would decide by Sunday whether to seek a warrant to arrest 48-year-old Lee, the third-generation leader of South Korea's largest conglomerate, or chaebol. There were no plans to bring him in for further questioning. Lee denied some of the suspicions against him but had admitted to others, said Lee Kyu-chul, a spokesman for the special prosecutors' office who declined to elaborate. The corruption scandal has engulfed the highest reaches of South Korea's elite, with Park impeached by parliament in December, a decision that must be upheld or overturned by the Constitutional Court. Park, who has been stripped of her powers in the meantime, has denied wrongdoing. Prosecutors were looking into whether he gave false testimony during a parliamentary hearing in early December, where the heads of nine of South Korea's biggest chaebol were subjected to an unprecedented 13-hour televised grilling by a panel investigating the presidential scandal. Jay Y. Lee's father Lee Kun-hee, who has been incapacitated since a 2014 heart attack, was handed a three-year suspended jail sentence in 2009 for tax evasion. He was later pardoned. Asked whether prosecutors would take into account any economic impact in their decision on whether to seek Jay Y. Lee's arrest, spokesman Lee Kyu-chul said: "From the point of the special prosecutor, we are conducting the investigation by law and principle. There is nothing further that I can say in that regard." Shares in group flagship Samsung Electronics, the world's largest smartphone maker, ended 3.45 percent lower on Friday. Park Sang-jin had signed a contract for Samsung Electronics in 2015 to sponsor an equestrian team, the main beneficiary of which was the daughter of President Park's friend Choi, a key figure in the scandal who is in detention and undergoing a criminal trial. Choi has denied wrongdoing. Park Sang-jin, who had refused to appear at parliamentary hearings on the matter citing health issues, did not comment to reporters as he left the prosecutors' office at about 3 a.m. (1900 GMT Thursday) wearing a white face mask. Dozens of South Korean corporate groups made contributions totaling 77.4 billion won ($65.75 million) to two foundations that were set up to back President Park's initiatives, but Samsung's donations were the largest. Late last month, the head of South Korea's National Pension Service, the world's third-largest pension fund, was arrested after he acknowledged that he had pressured the fund to approve the $8 billion merger between the two Samsung Group [SAGR.UL] affiliates while he was head of the health ministry, reversing an earlier public denial.